If you love to write long articles which we know many of you guys do (there is nothing better than a good fishing story). We recommend using H3 and images to break up your article. This is a must as our internet gets faster and faster and attention spans get shorter and shorter. You need to constantly be innovating to get your message out to a large group of people and keep them interested.
" With the lightening speed of social media distractions ... you are working with a 5-10 second attention span." Above we quoted a sentence that will appear in a a few paragraphs. (Also try to keep your paragraphs short, this is not high school or college english, this is the internet). This paragraph is probably the longest paragraph you are going to want to have. 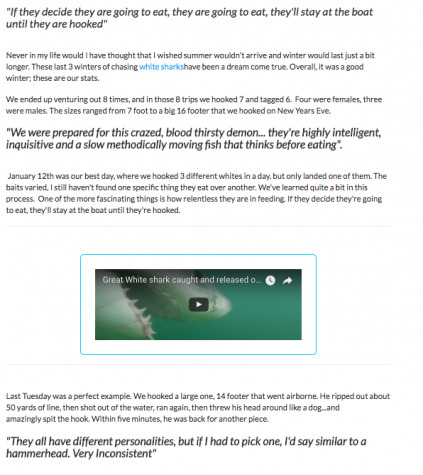 Below is a good example of breaking up a well written article using pictures videos and quotes. The above article has excellent writing as are most articles by #BullbusterAmbassador Outcast Sportfishing. He has a great writing style and we definitely recommend looking through his articles. H3 Quotes on the Bullbuster Community are a great way to keep your reader enticed. You may ask though, what is the best way to find a quote from my own writing? Below we break down this process. Step 1) Write your article first. Trying to pick a quote while writing an article is going to be super distracting. This is something you are going to want to do once you are done writing your article. Step 2) Scan for places in your article where there is too much uninterrupted text. We consider this between one to two paragraphs. Step 3) Look for exciting sentences 2-3 paragraphs down from the space you are going to need to fill in. Step 4) Paste your excerpt into the space where you need it. Step 5) Start at step 2) and do it again until there is no space between more than two paragraphs that has either a picture or a quote. We hope that you enjoyed this article and that it helps you spice up your long articles. With the lightening speed of social media distractions it requires constant innovation to keep the attention of your large fanbase. Articles are a great way to integrate everything you are working on, whether it be your youtube channel, snapchat, instagram, and facebook followers. If you are selling a brand direct product like a custom fishing rods and jigs, or a service like a fishing charter, this is a great resource for . Remember you are working with a 5-10 second attention span, you need to be constantly hooking people back into your article.